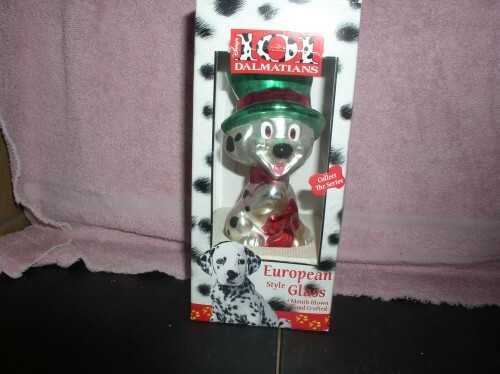 Disney 101 Dalmatians European dated 1999 Hand crafted glass ball ornament .It is hand painted and reflects skilled artistry with attention to detail. This ornament has not been taken out of the box. This ornament is in mint condition and in the original box the box is showing its age. This picture does not do this item any justice at all. THE BOX IS NOT MINT.Rena's Collectibles is your online source for Walt Disney Collectibles, Disneyana Memorabilia, Futurama, Simpsons, Nightmare Before Christmas, Capodimonte Laurenz, Toy Story, Lithographs, Art, Pewter, Bronzes and so much more. If you can't find it, chances are we have it. Call me and let me know what you are looking for!